I don’t like ribs. They are way too much work and mess for hardly any payoff. They don’t fill you up, you have to gnaw on the bones (which gives me the willies), and you always end up with sauce smeared in the corners of your mouth. I only bought pork babyback ribs last week because they were on sale at the grocery store, and I wasn’t much looking forward to cooking them. However, I set to work on a recipe from the May 2008 issue of Gourmet in order to finally get some use out of my bottle of black vinegar, substituting the babyback ribs for spareribs. Well, I loved this recipe. Unabashedly. I gnawed rib bones, people. 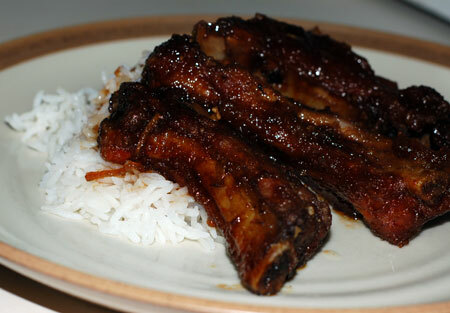 It took me a while to finish, because I had to do it in stages as Nolan’s temperament allowed, but we ended up with a saute pan full of sticky, chewy, aromatic ribs that were quickly devoured with platefuls of rice. If I’d known how good they were going to be, I would have considered doubling the recipe. I meant to steam some veggies to go along with them, but there just wasn’t time; I weighed my priorities and made white chocolate ice cream and brownies instead (recipes forthcoming, maybe tomorrow). I think this sauce, simmered down to glaze consistency, could be adapted to work with many cuts of pork or chicken, maybe even salmon… I certainly intend to give it a try in other applications myself. Blanch ribs in a 4-quart pot of boiling water 4 minutes. Drain and pat dry. Whisk 1/2 teaspoon salt into cornstarch in a large bowl. Add ribs, cover bowl with a plate, and toss. Heat 3 inches oil to 400°F in a 4- to 5-quart heavy pot, then fry ribs (in batches if necessary) 5 minutes per batch. Transfer with a slotted spoon to a bowl. Heat 2 tablespoons oil in a heavy medium saucepan over medium heat until it shimmers, then cook garlic, shallot, and ginger, stirring occasionally, until pale golden, about 2 minutes. Add brown sugar and cook, stirring, until dissolved, about 1 minute. Add wine and boil 1 minute. Add ribs with broth, vinegar, and soy sauce and simmer, covered, stirring and turning ribs occasionally, until tender, about 1 hour. Transfer ribs to a platter. Boil sauce, whisking, until thickened and emulsified, about 2 minutes; pour over ribs.